This is the spiritual and administrative center of the Church of Christ, Scientist, and the place where the renowned Christian Science Monitor is published. In 1866 a devout New England woman experienced quick recovery from a severe accident, attributing her cure to a glimpse of God's healing power as taught and lived by Jesus. Thereafter the woman, Mrs Mary Baker Eddy, devoted the remainder of her long life (1821-1910) to better understanding, practicing, and teaching Christian healing. 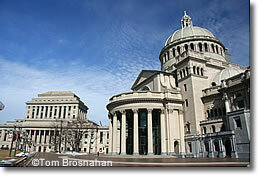 The Christian Science Church Center, 175 Huntington Ave, Boston (map), is the center of the faith based on Mrs Eddy's teachings: the First Church of Christ, Scientist, which also publishes the renowned international daily newspaper, the Christian Science Monitor. Today the Christian Science religion has branch churches in some 68 countries with headquarters in Boston, site of the denomination's Mother Church, built in 1894. Next to the church stands the Christian Science Publishing Society, traditional home of the Monitor and other Christian Science publications. Two church office buildings and the Sunday School complete the Church Center. The whole complex, at the intersection of Huntington Avenue and Massachusetts Avenue, is a Boston landmark, and it's right between two other landmarks, Symphony Hall and the Prudential Center. The main points of interest are the plaza and reflecting pool, the exterior of the Mother Church and its grand extension where services are held, and the Publishing Society's Mapparium and elegant Reading Room. You can take a tour, which lasts 15 to 25 minutes, through the Mother Church, or just take the elevator up to see the auditorium. This huge chamber is the main inner space of the church, which is built on the plan of a Byzantine church with its great dome and two semidomes. There is a charge for the Mapparium Tour, but if you have the Go Boston Card the Mapparium is included along with 63 other Boston attractions, activities, tours, excursions, museums and sites. To get here, take an MBTA subway Green Line E train ("Heath Street") to the Prudential or Symphony stations. 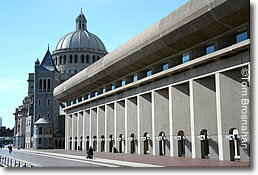 Above, Christian Science Church Center, with the Mother Church. Below, the Mother Church and Publishing House, with the Mapparium inside.